Pizza Time? 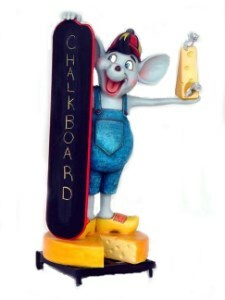 Cheese Mouse Display is Holding a Large Chalk Menu Board and Ready to Advertise your Daily Specials. Mouse/Cheese is Handcrafted from Resin and Stands on a Block of Cheese while offering a nice slice of Cheese to your Guest. Mouse/cheese Display is on a Metal Wheel Base for Easy Handling and Measures 30"l x 44"w x 66"h and Weighs Approx. 120 lbs. Great Displays for Pizza Parlors and Restaurants! Butlers and Signs offers free standard shipping to the lower US, although other arrangements can be made! Limited quantity available, so make your purchase today. Large Commercial, Party Themed and Event Decor! Quality Commercial Decor for Your Restaurant! Soldier with Menu Board ~ Life Size 6' Resin Soldier Statue! Copyright Butlers and Signs. All Rights Reserved. by 3DCart eCommerce Design.